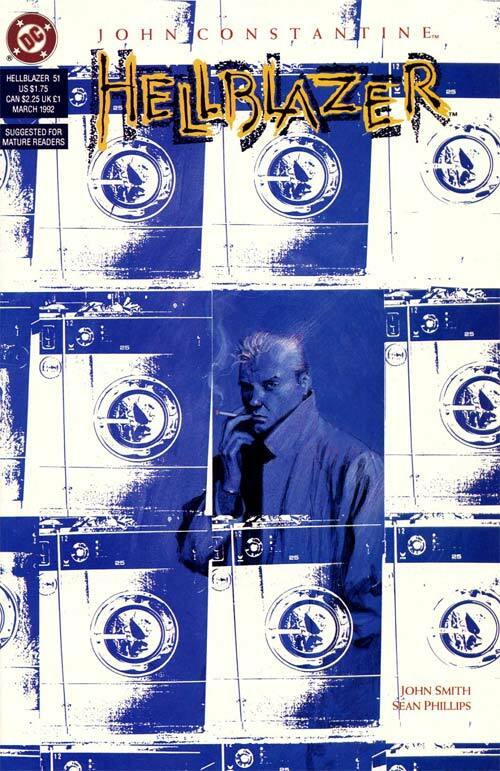 Dave McKean helped Jamie Delano close his Hellblazer run with some art that's absolutely incredible from start to finish. 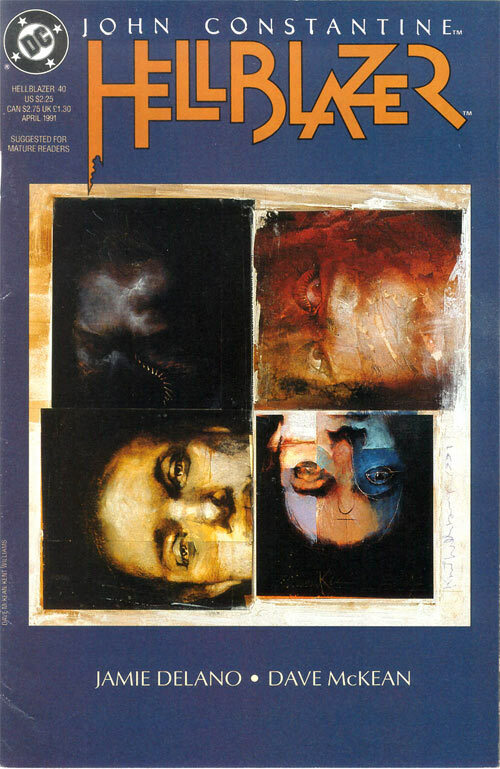 I love Dave McKean's painted style, I love his looser style too, but this comic (and #27 but that's on the Gaiman shelf) is amazing. This fill-in came out early during the Ennis run and, in my opinion, one of the scariest comics out there. John Smith (under-rated writer if there's ever been one) and Sean Phillips built here a perfect tale that keeps increasing the feelings of claustrophobia and weirdness page to page. The best thing is that Constantine is merely a spectator in the whole thing. Really recommended if you're into horror! 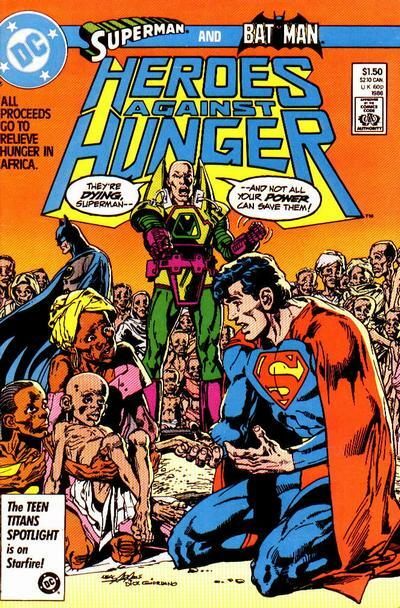 DC's response to Heroes for Hope below, they both follow the same idea: get some awesome writers and artists and set them loose on a story that's just an excuse to raise awareness of hunger in the world. 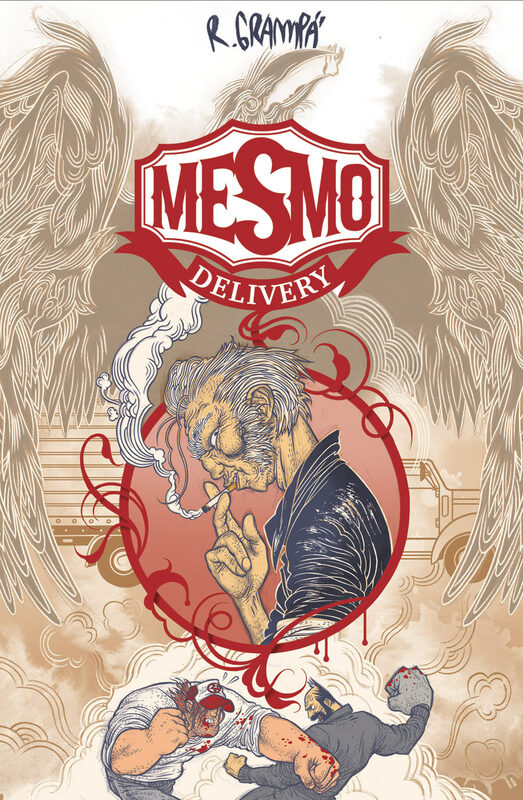 Not the best comic in the world, but some of the art here is amazing (Giffen, Windsor-Smith, Kirby, …). I guess, they tried to avoid using the same artists as Marvel's Heroes for Hope, so that gives Marvel the advantage of first picks I guess. 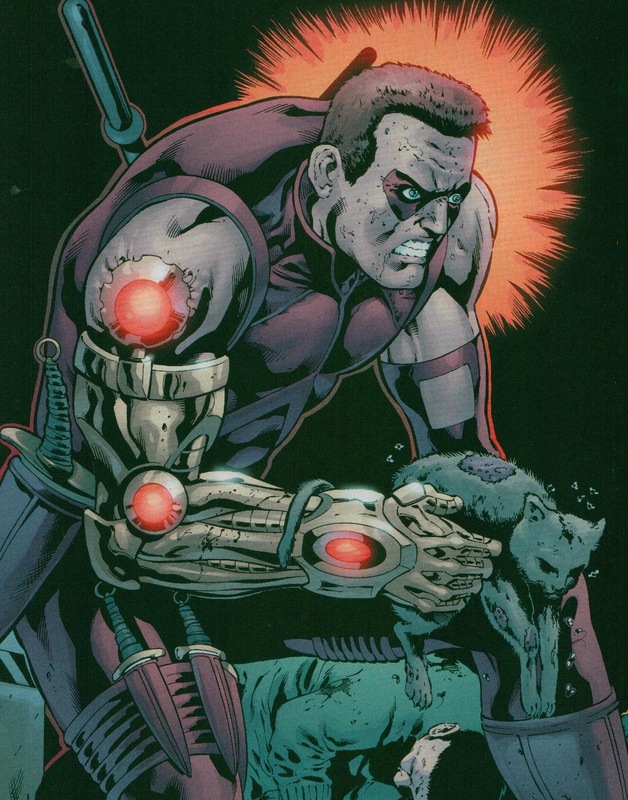 As I was saying, it's all about the first picks … Alan Moore and Richard Corben on a crazy Magneto sequence, Stephen King and Bernie Wrightson on Kitty Pride, a Frank Miller that was on the way to Dark Knight inked by Bill Sienkiewicz, Brian Bolland, John Byrne, … The list goes on and on. This book is responsible for me wasting a lot of time thinking about what artists I would pick up every couple of years for this type of experiment. 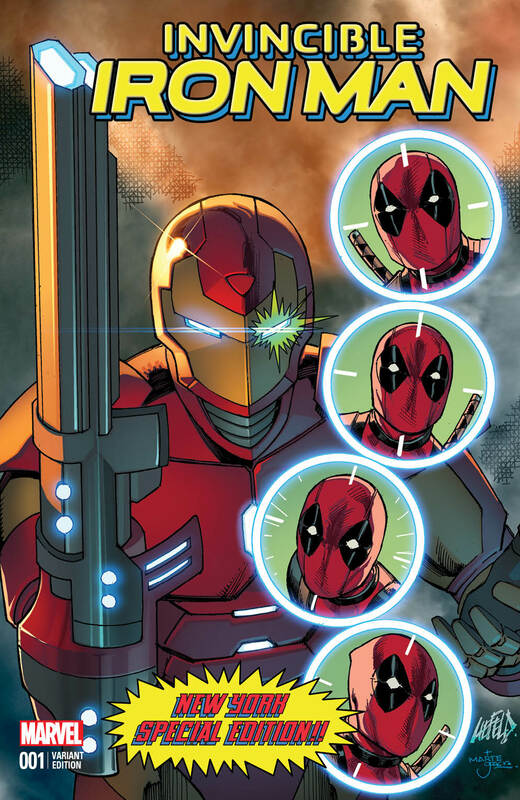 Rob Liefeld cover swiping his own swipe of another cover. The only reason why this is here is that it's signed by Rob Liefeld. Thanks Larry and Trey! This is a fun one-shot that completed a series of back-ups that never got completed. 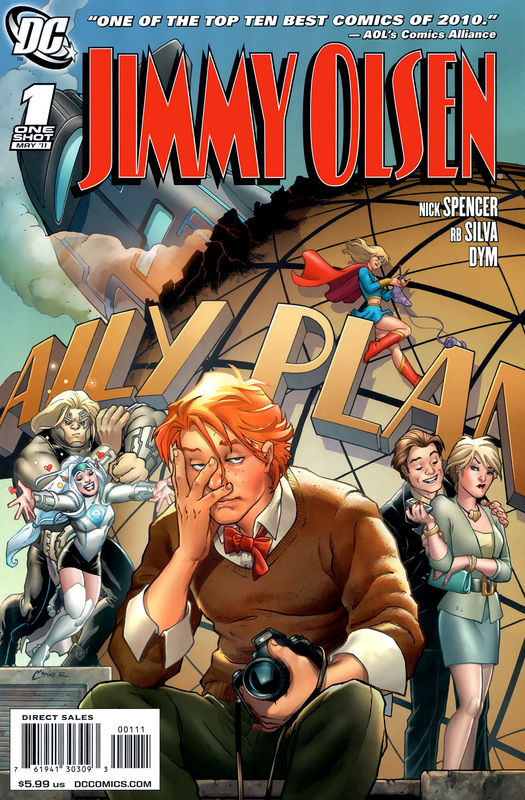 It's a great tribute to the silver age Jimmy Olsen series but also a perfectly valid Jimmy Olsen update that sadly didn't catch on. 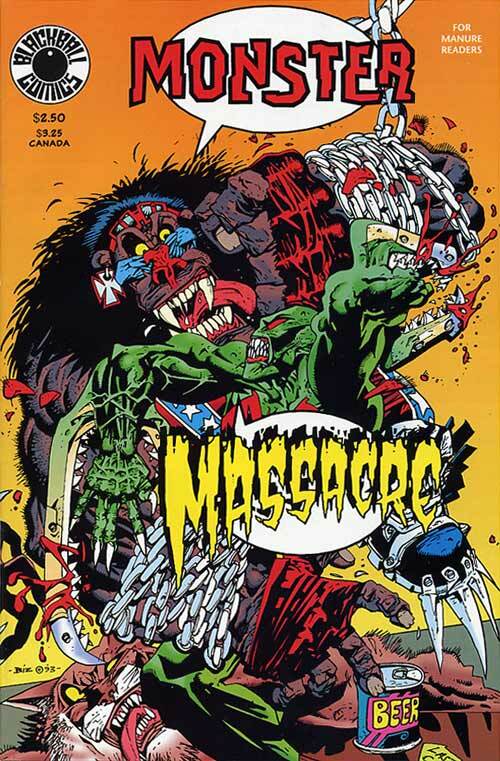 If you don't know about this, just google it up … and don't be surprised at all those links that hail this as the worst comic ever. Peter David and Ariel Olivetti give us the Last Avengers story!!! An epic story of redemption, second chances and ultimately hope. I really like alternate realities especially when they are well done. 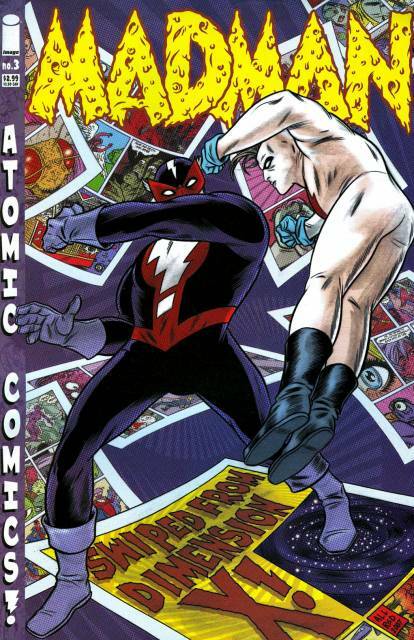 Kieron Dwyer's indie comic, which jumped to the headlines because of Starbuck's parody cover in the first printing that was censored. Definitely not an exercise in restraint and subtlety but I love Dwyer's art and it's always fun to see this kind of artist go crazy with whatever they want to draw. I think Madman is a fun comic but, like with Mister Monster, whenever I jump into it I stop after a couple of issues. 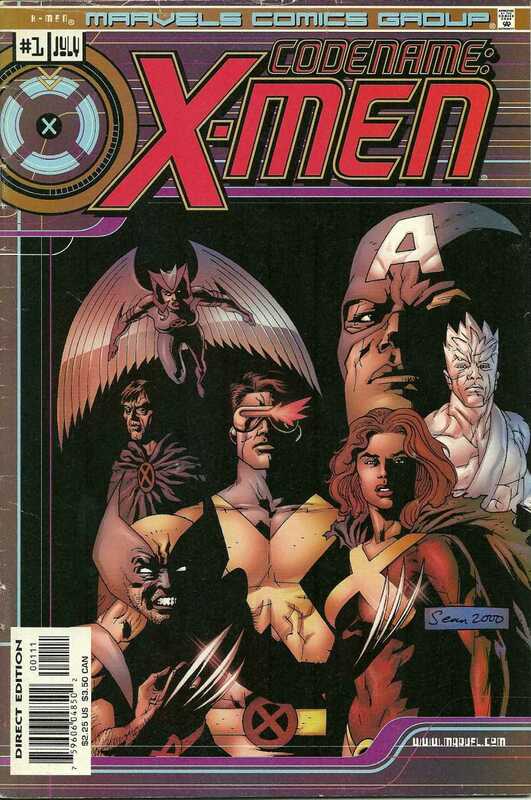 There are some great issues in the different series, though, and this one I check every so often. Most of the issue is an amazing sequence where Allred perfectly mimics the style of over a hundred different comic artists. I am not exaggerating, it's a lot of fun to try to guess who's who. 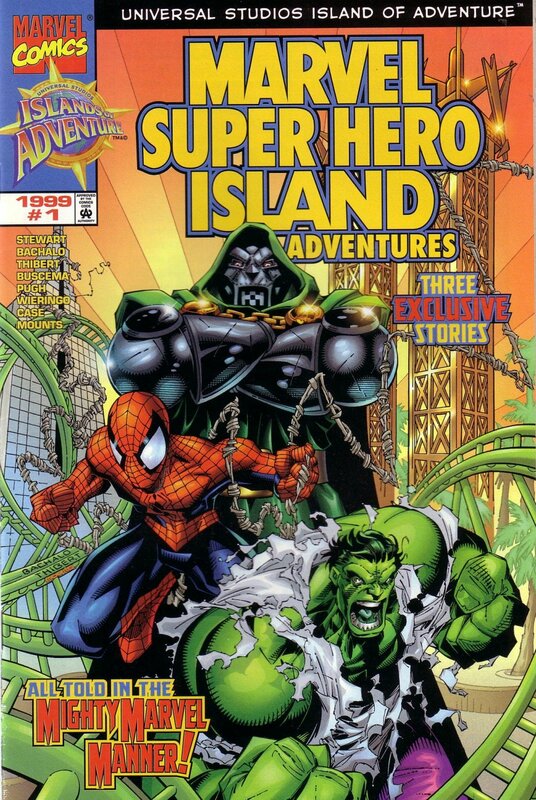 Exclusive comic sold at Marvel Super Hero Island (I guess), this comics features the first Bachalo Spider-Man story and Wieringo's first work in Fantastic Four. To top it all, a Hulk story by Steven Pugh. 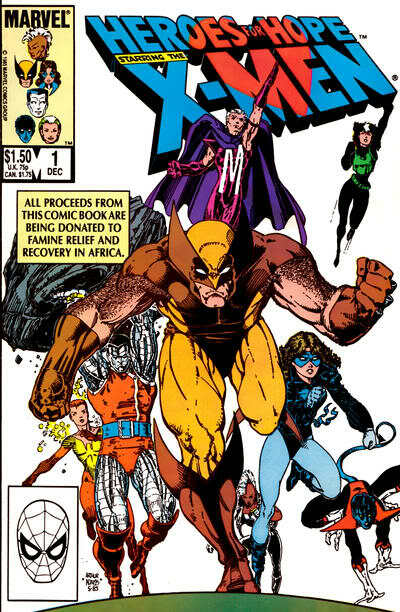 Not the best know comic in history, but it's fun and has some historical interest for OCD collectors like myself. 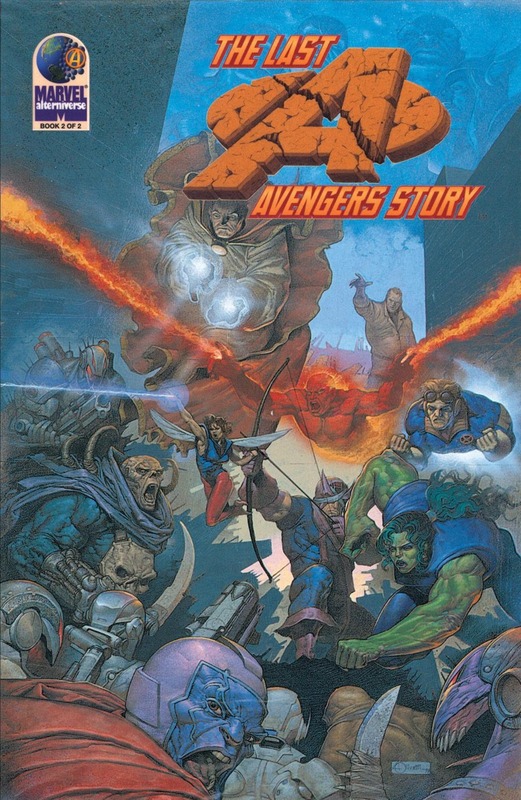 One of the titles published as a 5-week event where Marvel pretended to be a comic company within the Marvel Universe and give us a look at what their comics might look like. This one stands out for its sheer lunacy. Mark Millar, Duncan Fegredo and Sean Phillips give us a mutant Suicide Squad that, even though they are mutants, are kinda OK because they hate themselves. Doctor Strange as the cannibal leader of the Brotherhood of Evil Mutants is worth it the 50 cents this will cost you. 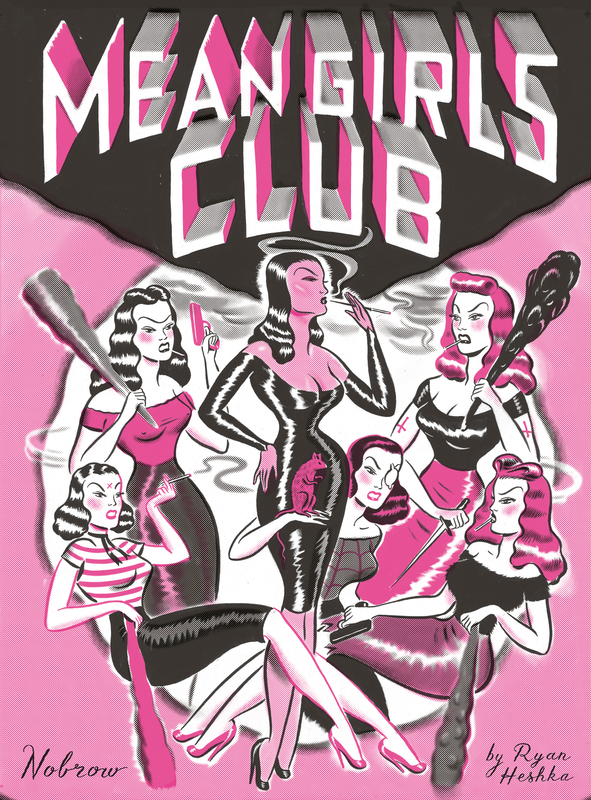 The last addition to the shelf, this is a beautiful comic … Black, white and fuchsia all over and a story that evokes all those 50's women gone crazy comics, it gives us a day in the life of the Mean Girls Club as they drink, smoke, take pills and generally create mayhem on the unsuspecting general population. One of my favourite comics this year, this has made sure I keep my eye on Nobrow Press in the future. Rafael Grampá's tale of a couple of truckers stopping at a bar and the results are unpredictably insane. If you've never come across Grampá's art before, next time you go to the shop take a look at this. His style is fresh, his action scenes are delicious. Another one of those guys we might have already lost to other media, I hope he at least keeps doing the sporadic cover. Travis Charest, we barely knew you! Mister Monster: Who Watches the Garbagemen? 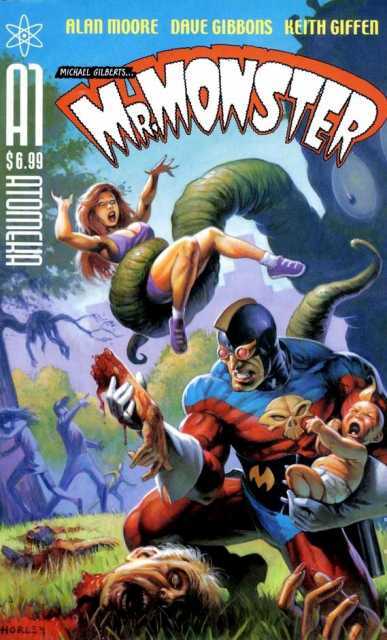 I should love Mister Monster, he's a costumed guy fighting monsters, which is right up my alley. Somehow, it's never managed to hook me completely. This issue reprints stories by Alan Moore, Keith Giffen and Dave Gibbons and that's worth a ticket back home if I've ever seen one. 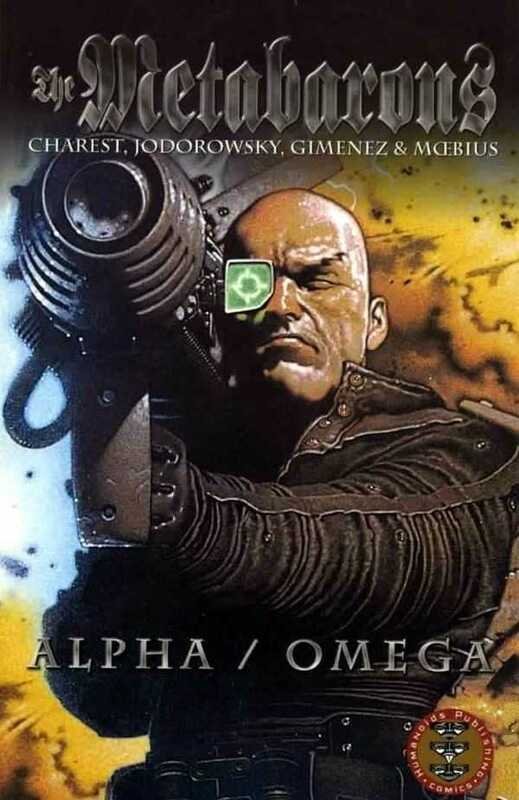 More Atomeka / Blackball madness, more Bisley, O'Neill, O'Barr, Taylor, … All of them having fun and going nuts with their own new creations, nothing wrong with that. These I could probably live without though, seeing as there's no Giffen in sight! 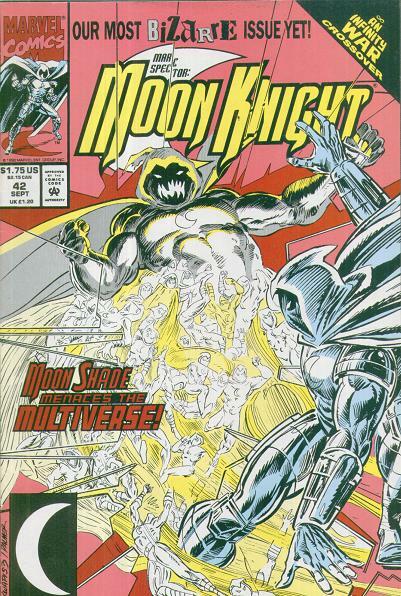 Hold on to your hats, we're boarding the crazy train … So during Infinity War, Moon Knight's doppelgänger (created by Magus) gains some level of extra consciousness, names himself Moon Shade and proceeds to annihilate all the Moon Knights in all realities. The craziest aspect of this book though, is that each one of these alternate Moon Knights is a tribute to a Batman Elsewords. That and the fact that they are using the original artists of those Elseworlds: Klaus Janson for Dark Knight, Kelley Jones for Vampire Moon Knight, Norm Breyfogle for Holy Terror Moon Knight, … It's a nice tribute to Batman, don't get me wrong, but in Moon Knight? We're already halfway through the shelf, and we still haven't received any submissions to the collection spotlights. At this point, I think you're just doing it to see me feature my New Universe coloring guidelines collection afterwards, but that's not happening. Mostly because it doesn't exist.